Yellow decorations in glasses have been produced since the beginning of the fourteenth century by incorporating metallic silver nanoparticles into the glass (from a few to some tens of nanometers). 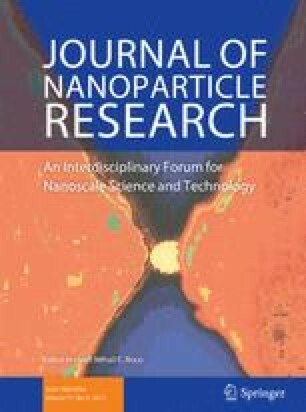 The optical response of the glass-particles composite is determined by the surface plasmon resonance absorption and scattering of the nanometric metallic particles. Generally, the same color is perceived in reflection and in transmission although dichroic effects are occasionally observed. As silver-stained glasses were designed to be observed in transmission, tuning the transmission color from yellow to red was of technological interest. The relationship between the color observed both in transmission and reflection and the composition and nanostructure of regular (yellow) and dichroic (yellow and red) silver stains from the Renaissance (late fifteenth and sixteenth century, respectively) is related to the presence of a layer (of about 10–20 μm thick) of metallic silver nanoparticles (from few to 100 nm in size). The correlation between the colors observed and the silver stain nanostructure is studied with particular emphasis on the origin of the dichroic behavior. The optical response is computed and compared to the experimental data. Differences in the synthesis parameters responsible for the colors and for the dichroic behavior of the silver stain glasses are proposed. This is essential for the replication of the glass pieces which are required as replacements in the restoration/conservation of the windows but is also of broader interest. The project is funded by CICYT grant MAT2010-20129-C02 and Generalitat de Catalunya grants 2009SGR01225 and 2009SGR01251. Vetraria Muñoz de Pablos S.L. is thanked for providing the glass pieces studied, Chaoren Liu for his help with DSC measurements and Trifon Trifonov for his skilled help with the TEM sample preparation.